The Leap chair was developed based on the finding of four years of research, 27 scientists, 11 studies and 732 test participants. Out of this research came important discoveries about how people sit, leading to advanced seating technology. The Leap chair's back moves as your back moves. Its arms move as your arms move. Its seat moves as your seat moves. 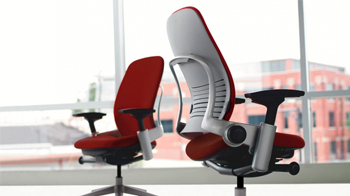 It's the first chair that actually changes shape to mimic and support the movement of your spine.